Just after sunset. Static shots of with the horizon near the bottom of the image. With any foreground trees or buildings. These give the image a sense of scale. After dark when the region of the sky you will be shooting is above the horizon shoot images the background stars exposed for good detail and color. These will be stacked for the high quality background image. 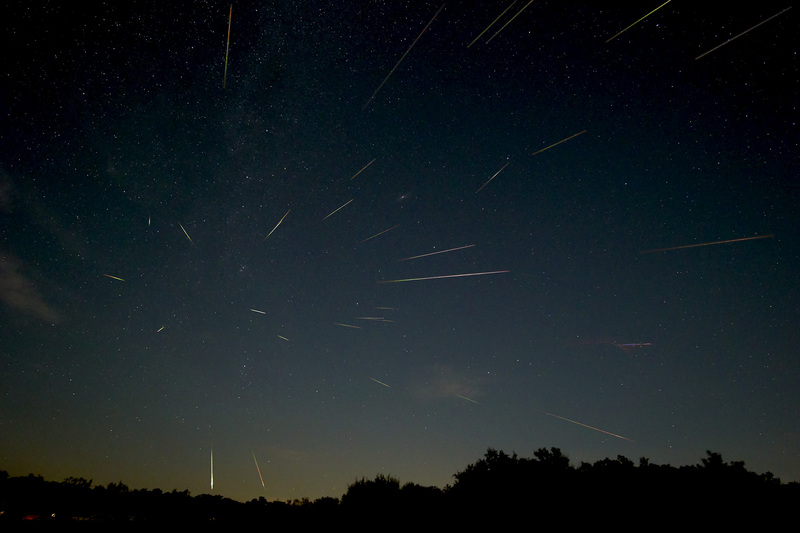 Meteors can look much brighter than the stars. To capture them you will want several stops more exposure, because they appear so briefly. Finally don't sort your images when you haven't slept for over 24 hours! My shots were a little underexposed to pick out fainter meteors. With over exposure, it is easy to loose the transition in color from blue to red as they slow down in the atmosphere. After filtering out the shots with airplanes and car lights, I'm pleased with the final result. The coolest thing that I realized from this project is that, when not over exposed, each meteor makes a little rainbow along its path. Hot blue or green at the start while it is still moving fast and ending up red as it slows down and melts away. By eye they are so quick and bright or dim I don't notice much color except at the end. My earlier camera meteor images and most others that I've seen must be overexposed blowing out any color. The Photoshop composite file has thirty-seven layers. When I tried to save it, I hit the dreaded Photoshop 2GB limit, but it saved nicely as a 1GB PSB large document format file. Yes, OS X has a 8,000,000,000 GB file size limit, but Adobe says it all.